* Senior club appearances and goals counted for the domestic league only and correct as of 23:06, 6 November 2016 (UTC). Adam David Lallana (born 10 May 1988) is an English professional footballer who plays as an attacking midfielder for Premier League club Liverpool and the England national team. Since his senior international debut in 2013, Lallana has made over 20 appearances for England and represented them at the 2014 FIFA World Cup and the 2016 UEFA European Championship. Lallana was born in St Albans in Hertfordshire but moved to the Iford area of Bournemouth when he was five years old. He attended Corpus Christi School followed by St Peter's Catholic Comprehensive School. As a child, Lallana supported Everton, like his father. 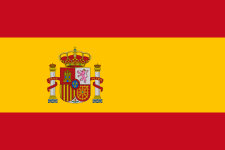 He is of Spanish descent through his paternal grandfather. Lallana was a member of the Bournemouth Centre of Excellence, where he was spotted by a talent scout from Southampton. He joined the Premier League club's Saints Academy as a 12-year-old in September 2000. Southampton paid £3,000 compensation to Bournemouth with further payments of £5,000 and £10,000 when he signed scholarship and professional contracts respectively. On 7 January 2011, Lallana signed a new contract with Southampton which would expire in the summer of 2015. He was named in the League One Team of the Year for the 2010–11 season after scoring 11 goals that season. He then scored on the opening day of the 2011–12 season, a 3–1 victory over Leeds United at St Mary's Stadium which broke a 12-year hoodoo of Southampton not winning on the opening day and secured a record-breaking seventh consecutive league win. He then scored twice in a 5–2 victory at Ipswich Town. His 150th start for the club came in a 1–1 draw at south coast rivals Portsmouth. His tenth goal of the season came in a 4–0 victory over Derby County. He then grabbed a brace in a 2–0 victory over Barnsley. He was nominated for the Player of the Year award but lost out to teammate Rickie Lambert. Along with Lambert and Kelvin Davis, he was one of three Southampton players named in the Championship Team of the Year for the 2011–12 season. He scored on the final day of the campaign to finish with 13 goals, 11 of which came in the league. He made his first Premier League appearance on the opening day of the 2012–13 season, setting up a goal and wearing the captain's armband in a 3–2 defeat against 2011–12 champions Manchester City. He scored his first Premier League goal in a 4–1 defeat away to West Ham United. His second goal of the season came on 25 November, as he opened the scoring in a 2–0 home win against Newcastle United. The 50th goal of his career came in a 2–0 victory at Reading. On 11 April 2013, Lallana signed a new five-year contract with Southampton. 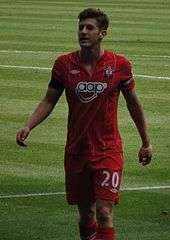 In Southampton's 4–1 Premier League victory over Hull City on 9 November 2013, Lallana started with the ball 30 yards from goal and dribbled his way past five players into the left-hand side of the 18-yard box, before slotting it past Hull goalkeeper Steve Harper. On 18 April 2014, he was named as one of the six players on the shortlist for the PFA Player of the Year award. On 27 April 2014, he was named alongside teammate Luke Shaw in the PFA Team of the Year. On 6 May, he was crowned as both the Southampton Players' Player and Fans' Player of the year. Prior to the World Cup, Lallana was subject to interest from Premier League runners-up Liverpool. After long periods of negotiation Liverpool placed a reported £25 million bid which was accepted by Southampton. Following England's return from the World Cup, Lallana signed for Liverpool, and was handed the number 20 shirt, the number he wore during his time at Southampton. Bournemouth, Lallana's youth team, had originally included a 25% sell-on-clause in his contract when he joined Southampton, but only received £4 million after agreeing to a reduced fee with Southampton. Lallana was the second of three players to transfer from Southampton to Liverpool during the summer of 2014, behind Rickie Lambert and later followed by Dejan Lovren. 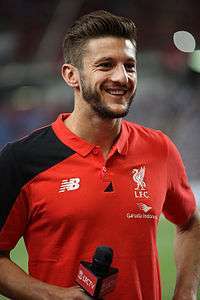 On 17 September 2015, Lallana scored the opening goal in the new Europa League season opening group stage away game against Bordeaux at the Stade Chaban-Delmas, a match Liverpool went on to draw 1–1. On 1 October, Lallana scored in a second game in a row against Sion in the Europa League but the game ended in a 1–1 draw. On 23 January 2016, he came on as a second-half substitute and scored an injury-time winner in Liverpool's 5–4 away win at Norwich City. On 28 February 2016, Lallana came on as a second-half substitute and missed in the penalty shoot-out against Manchester City, resulting in Liverpool's loss in the 2016 Football League Cup Final. On 3 March 2016, he scored and assisted in Liverpool's 3–0 home win against Manchester City. So far this season Lallana has made 11 Premier League appearances scoring three goals and providing five assists. Of the 11 games he has played so far, eight have been victories only losing once to Burnley. On 7 November 2013, along with Southampton team mates Rickie Lambert and fellow uncapped Saint Jay Rodriguez, he was called up to the England team. Lallana won his first cap for England on 15 November by starting a friendly match against Chile at Wembley Stadium. Although England lost 2–0, Lallana's performance received generally favourable reviews. He also started in England's defeat against Germany four days later. He gained his third cap in a 1–0 friendly win against Denmark on 5 March 2014, coming on as a substitute for Jack Wilshere and crossing for Daniel Sturridge to head in the only goal of the game. On 12 May 2014, Lallana was named in the 23-man England squad for the 2014 FIFA World Cup. He made his competitive debut on 14 June in the first group game against Italy, coming on for the last 10 minutes in place of Sturridge who had scored England's goal in the 1–2 defeat. Lallana scored his first goal for England on 4 September 2016 in a 2018 FIFA World Cup qualification away match to Slovakia at Štadión Antona Malatinského. It came during stoppage time and proved to be England's winning goal of the match. Lallana scored his second England goal on 11 November 2016 in a 2018 FIFA World Cup qualification game against Scotland. The final score was England 3 Scotland 0, with Daniel Sturridge and Gary Cahill also scoring. Lallana married his fiancée Emily Jubb, on 24 December 2013. The couple who had been dating for seven years, were due to marry on 14 June 2014, which coincided with England's opening World Cup match with Italy. They wed at Poole Register Office in Dorset. Together, they have two sons, Arthur Michael, born on 26 September 2012 and Albie George born on 3 June 2015. In 2014, Lallana was signed as a French Connection model, to promote their Autumn/Winter collection. He revealed his fashionable photo shoot at an interview with Esquire Magazine. As of match played 15 November 2016. England score listed first, score column indicates score after each Lallana goal. ↑ "Adam Lallana". England Players Index. England Football Online. Retrieved 29 July 2016. 1 2 "Bank on Adam". Bournemouth Echo. 11 December 2008. Retrieved 28 March 2016. ↑ Bascombe, Chris (26 September 2014). "Liverpool v Everton: Boyhood Evertonian Adam Lallana closing in on his best form ahead of Merseyside derby". The Telegraph. Retrieved 26 September 2014. ↑ "Lallana talks Zidane, BR and Spanish roots". Liverpool F.C. 17 November 2014. Retrieved 1 January 2015. ↑ BTSPOfficial (6 May 2014). "BTSP - Mean Tweets - Adam Lallana - Southampton" – via YouTube. ↑ "Southampton 5–2 Yeovil". BBC Sport. 23 August 2006. Retrieved 4 January 2014. ↑ "Lallana signs new deal". Southampton F.C. 31 October 2006. Archived from the original on 29 September 2007. Retrieved 9 October 2007. ↑ "Lallana on loan". Southampton F.C. 9 October 2007. Retrieved 9 October 2007. ↑ "West Brom 1–1 Southampton". BBC Sport. 28 April 2008. Retrieved 4 September 2009. ↑ "Midfielder Signs Long Term Deal". Southampton F.C. 7 January 2011. Archived from the original on 10 January 2011. Retrieved 8 January 2011. ↑ Leitch, Adam (7 January 2011). "Lallana signs new Saints deal". Southern Daily Echo. Retrieved 8 January 2011. ↑ "Man City 3–2 Southampton" BBC Sport. 19 August 2012. Retrieved 25 November 2012. ↑ "West Ham 4–1 Southampton" BBC Sport. 20 October 2012. Retrieved 25 November 2012. ↑ "Southampton 2–0 Newcastle" BBC Sport. 25 November 2012. Retrieved 25 November 2012. ↑ "Southampton: Adam Lallana signs a new five-year contract". BBC Sport. 11 April 2013. Retrieved 12 April 2013. ↑ "Adam Lallana's brilliant goal helps Southampton crush feeble Hull City". The Guardian. 9 November 2013. Retrieved 30 April 2014. ↑ "PFA award: Liverpool's Suarez, Gerrard & Sturridge on shortlist". BBC Sport. 18 April 2014. Retrieved 19 April 2014. ↑ Williams, Simon (6 May 2014). "2013/14 Player Awards The winners". Southampton F.C. Retrieved 10 May 2014. ↑ "Liverpool bid for Lallana". The Guardian. The Guardian. Retrieved 1 July 2014. ↑ "Bournemouth owner explains Lallana sell on clause". Bournemouth Echo. Bournemouth Echo. Retrieved 1 July 2014. ↑ "Adam Lallana: Liverpool sign Southampton captain for £25m". BBC. 1 July 2014. Retrieved 1 July 2014. ↑ Bascombe, Chris (25 July 2014). "Liverpool suffer blow to preparations as Adam Lallana ruled out for six weeks with knee injury". The Daily Telegraph. Retrieved 21 August 2014. ↑ Bevan, Chris (13 September 2014). "Liverpool 0–1 Aston Villa". BBC Sport. Retrieved 13 September 2014. ↑ "Liverpool 2–1 West Brom". BBC Sport. 4 October 2014. Retrieved 4 October 2014. ↑ Johnston, Neil (2 December 2014). "Leicester 1–3 Liverpool". BBC Sport. Retrieved 3 December 2014. ↑ Bascombe, Chris (29 December 2014). "Liverpool 4 Swansea City 1: Adam Lallana shows his class as Liverpool cruise to victory". www.telegraph.co.uk. Retrieved 30 December 2014. ↑ Fifield, Dominic (14 February 2015). "Liverpool fight back to edge past Crystal Palace with Adam Lallana winner". The Guardian. Retrieved 15 February 2015. ↑ "Bordeaux 1–1 Liverpool". BBC Sport (British Broadcasting Corporation). 17 September 2015. Retrieved 26 September 2015. ↑ "Liverpool 1–1 Sion". BBC Sport (British Broadcasting Corporation). 1 October 2015. Retrieved 5 October 2015. 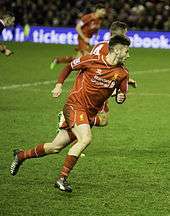 ↑ "Norwich 4-5 Liverpool: Adam Lallana nets last-gasp winner in thrilling goalfest". Sky Sports. Retrieved 2016-01-23. ↑ "Liverpool-Manchester City Live". www.whoscored.com. Retrieved 10 March 2016. ↑ "England squad: Southampton striker Jay Rodriguez called up". BBC Sport. 7 November 2013. Retrieved 7 November 2013. ↑ McNulty, Phil (15 November 2013). "England 0 – 2 Chile". BBC Sport. Retrieved 17 November 2013. ↑ Burt, Jason (15 November 2013). "England v Chile: Adam Lallana flies flag high for Southampton". Daily Telegraph. Retrieved 17 November 2013. ↑ "England 0 – 1 Germany". BBC Sport. 19 November 2013. Retrieved 30 March 2014. ↑ "England 1–0 Denmark". BBC Sport. 5 March 2014. Retrieved 14 June 2014. ↑ "England World Cup squad 2014: Ross Barkley and Raheem Sterling called up". The Guardian. 12 May 2014. Retrieved 14 May 2014. ↑ McNulty, Phil (14 June 2014). "Italy 2–1 England". BBC Sport. Retrieved 15 June 2014. 1 2 "Last-gasp Lallana gets Allardyce's England era off to a winning start". ESPN. Entertainment and Sports Programming Network. 4 September 2016. Retrieved 4 September 2016. 1 2 McNulty, Phil (11 November 2016). 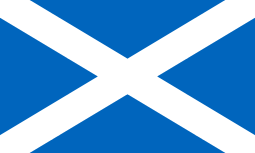 "England 3–0 Scotland". BBC Sport. Retrieved 12 November 2016. ↑ Richards, Chris (26 December 2013). "Southampton star Adam Lallana weds fiancee early to ensure he is available for England's World Cup bid". TheMirror.com. Retrieved 1 April 2014. ↑ "Southampton Football Club captain Adam Lallana celebrates after girlfriend gives birth to baby boy". Southern Daily Echo. 28 September 2012. Retrieved 1 April 2014. ↑ "Fashionable Football: Adam Lallana sporting latest FCUK collection". AdamLallana.com. 3 May 2014. Archived from the original on 19 November 2015. Retrieved 18 November 2015. ↑ "Games played by Adam Lallana in 2006/2007". Soccerbase. Centurycomm. Retrieved 12 December 2013. 1 2 "Games played by Adam Lallana in 2007/2008". Soccerbase. Centurycomm. Retrieved 12 December 2013. ↑ "Games played by Adam Lallana in 2008/2009". Soccerbase. Centurycomm. Retrieved 12 December 2013. ↑ "Games played by Adam Lallana in 2009/2010". Soccerbase. Centurycomm. Retrieved 12 December 2013. ↑ "Games played by Adam Lallana in 2010/2011". Soccerbase. Centurycomm. Retrieved 12 December 2013. ↑ "Games played by Adam Lallana in 2011/2012". Soccerbase. Centurycomm. Retrieved 12 December 2013. ↑ "Games played by Adam Lallana in 2012/2013". Soccerbase. Centurycomm. Retrieved 12 December 2013. ↑ "Games played by Adam Lallana in 2013/2014". Soccerbase. Centurycomm. Retrieved 28 March 2016. ↑ "Games played by Adam Lallana in 2014/2015". Soccerbase. Centurycom. Retrieved 28 March 2016. ↑ "Games played by Adam Lallana in 2015/2016". Soccerbase. Centurycomm. Retrieved 29 May 2016. ↑ "Games played by Adam Lallana in 2016/2017". Soccerbase. Centurycomm. Retrieved 12 November 2016. 1 2 "Lallana, Adam". National Football Teams. Retrieved 12 November 2016. 1 2 "A. Lallana". Soccerway. Perform Group. Retrieved 9 April 2016. ↑ League, The Football. "The Football League announces its Team of the Decade". www.football-league.co.uk. Retrieved 14 March 2016.